Each action potential triggers a large increase in neuronal intracellular calcium concentration, which then quickly (within milliseconds) returns to the pre-activation baseline. Thus, activity of multiple individual neurons (and of their dendritic or axonal compartments) can be measured using in vivo two-photon microscopy. We use mice expressing calcium-sensitive fluorescent proteins (such as GCaMP6f) on Thy1 promoter. GCaMP6f can also be expressed in wild-type mice or tg mouse models of disease. Accumulating recent evidence shows that general anesthetics (including the commonly used Ketamine) have strong and lasting effects on neuronal calcium signaling. This is why all calcium imaging experiments are performed at Neurotar in non-anesthetized, awake and behaving mice. This type of studies is enabled by our proprietary device called Mobile HomeCage (which was initially developed to facilitate our contract research studies in vigilo, i.e. in awake mice). Yuryev M, Pellegrino C, Jokinen V, Andriichuk L, Khirug S, Khiroug L, Rivera C. (2016) In vivo Calcium Imaging of Evoked Calcium Waves in the Embryonic Cortex. Front Cell Neurosci. 9:500. 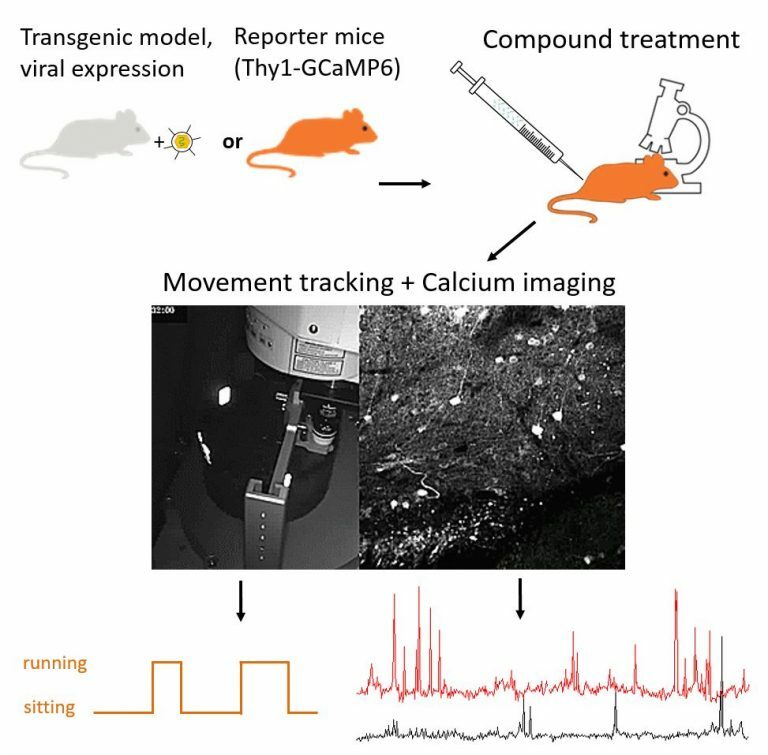 Dana H, Chen TW, Hu A, Shields BC, Guo C, Looger LL, Kim DS, Svoboda K. (2014) Thy1-GCaMP6 transgenic mice for neuronal population imaging in vivo.PLoS One. 9(9):e108697.